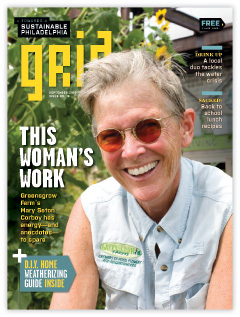 Thanks so much for the Dispatch you printed in the September issue of Grid (“The River Wild”). Five years ago, I lived for a while in Heidelberg, Germany, and was able to swim in natural waters pretty often. Heidelberg is a beautiful town, and the local forest terrain and waterways there feel just like home to a native Pennsylvanian. Heidelberg is on a river called the Neckar, which always reminded me of the Schuylkill. While I was there, we swam in the Neckar many times—jumping (illegally) off the Alte Brucke, and swimming (legally) from a beach that the city set up for sunbathers and swimmers. At the beach, they had a wooden dock that went out into the river a bit, which allowed you to get easily into the water. Then, when you got out of the water, they had outdoor public showers so you could rinse off. The showers were real simple, just cold water, but it was all set up in a clean Euro/Ikea sort of way. I have a very good tip for your readers re: “View Point” (Energy Column: Windows, October 2010). I discovered serendipitously how to block heat from east-facing windows in the summer (I’m in South Philly, so no trees anywhere) and remove the block to absorb heat in winter. A kind note to tell you how much I appreciate the contribution you are making—and have been making—to our community since issue one. This publication is truly unparalleled and an amazing resource for gardeners, food lovers and conscientious Philadelphians everywhere! A recent transplant from D.C. (and a Maryland master gardener), it makes me proud to live in a city where this type of publication is possible. And, I must add, your reputation seems to be widespread: I was sitting at Café L’Aube this weekend, ready to devour a savory crepe and the latest Grid, when a passerby noticed my reading material and became excited that the new issue was finally out. I felt the same way and proceeded to savor every page, and every bite! Thank you again. I will continue to save every issue I’m lucky enough to get my hands on!